The Moluccan Cockatoo, Cacatua moluccensis also known as Salmon-crested Cockatoo is a cockatoo endemic to south Moluccas in eastern Indonesia. At 50 cm, it is among the largest of the white cockatoos. The female is larger than the males on average. It has white-pink feathers with a definite peachy glow, a slight yellow on the underwing and underside of the tail feathers and a large retractable recumbent crest which it raises when threatened, revealing hitherto concealed bright red-orange plumes to frighten potential attackers (may also be raised in excitement, or other ’emotional’ displays). It also has one of the louder calls in the parrot world and in captivity is a capable mimic. In the wild the Moluccan Cockatoo inhabits lowland forests below 1000m. The diet consists mainly of seeds, nuts and fruit, as well as coconuts. The Moluccan Cockatoo is a vulnerable species, and has been listed on appendix I of CITES since 1989, which makes trade in wild-caught birds illegal. Trade in captive bred birds is legal only with appropriate CITES certification. Numbers have declined due to illegal trapping for the cage-bird trade and habitat loss. During the height of the trapping of this species over 6,000 birds were being removed from the wild per year. It has a stronghold in Manusela National Park on Seram, although even today some illegal trapping continues. 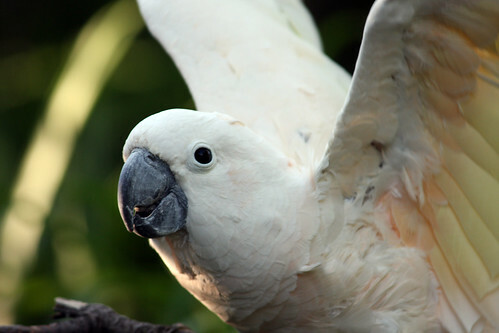 The Moluccan Cockatoo can no longer be imported into the United States because it is listed on the Wild Bird Conservation Act. However, they are being bred in captivity. They are popular for their beauty and trainability (which makes them popular in trained bird shows). The Moluccan Cockatoo is widely considered to be the one of the most demanding parrots to keep as a pet due to their high intelligence, large size, potential noise level, and need to chew. Moluccan cockatoos require a very large and very sturdy cage or aviary. Moluccans are highly social and pets can be extremely cuddly, affectionate, and gentle birds. This can lead to problems if a young cockatoo is spoiled with a great deal of attention and cuddling when young and does not get the opportunity to learn to play with toys, forage, or otherwise entertain itself. Moluccan cockatoos require a great deal of attention and activity to remain healthy and well-adjusted. Attention and training from human caregivers is important in keeping them occupied, as are chewable toys and foraging toys that require them to work for their food. As with most large cockatoos, the Moluccan Cockatoo may develop health and behavioral problems such as feather-plucking and aggression if not provided with the appropriate environment, attention, and enrichment opportunities. I will be busy for awhile today. I have so much work around my house that I’m trying to catch up on. Wish I had a maid but my husband doesn’t want the job. LOL! Yesterday I ended up not being on Flickr much at all so I want to apologize for missing so many of your beautiful photos. I hope to eventually catch up. It’s still very hard for me to sit at my computer for long periods but I’ll do my best. Thanks so much for all your kind comments and invites. I really appreciate you all and treasure my friendships here on flickr. I hope everyone has a mighty fine day!